Myanmar is in need of a structural transformation from an agrarian economy to one based more on a mix of modern activities, including manufacturing and services. Modernising the agricultural sector by building linkages to complementary non-agricultural activities – an “agricultural value chain” approach – could set in motion this process of structural transformation. Furthermore, given Myanmar’s level of economic development, its large rural population and the weight of agriculture in the economy, a development strategy that puts agriculture and rural development at its core has the potential to make a significant positive impact for millions. 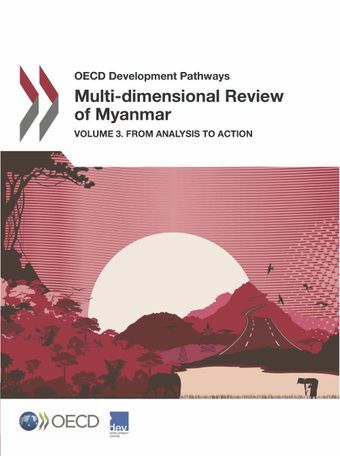 This third report of the Multi-dimensional Review of Myanmar synthesises the findings and recommendations from the first two reports according to the following priorities as defined by stakeholders in Myanmar: supporting the agri-food sector’s ability to respond to market demand for quality products; introducing innovative models of delivering extension services and training to upgrade agronomic and technical skills; providing the conditions for a vibrant financial system that meet the needs of rural areas; strengthening land rights; engaging citizens in the policy making process; and managing and maximising the benefits of emigration from rural areas.